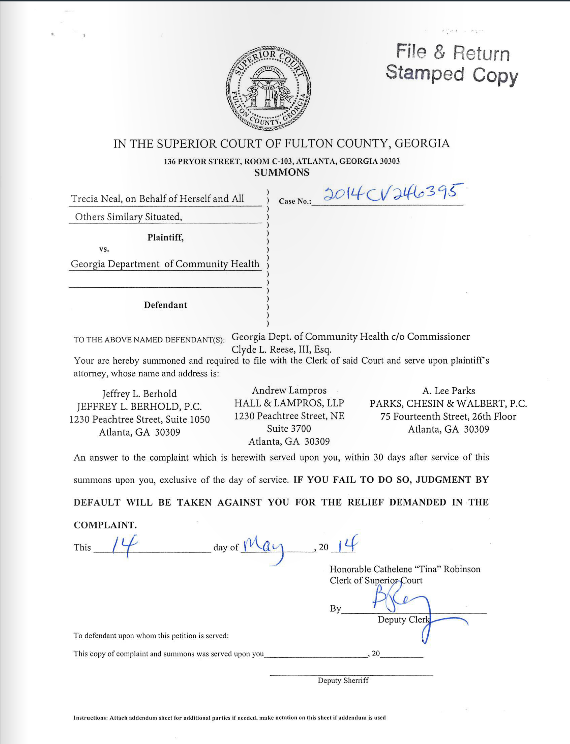 A class-action lawsuit was filed against the Department of Community Health (DCH) on May 14 due to Georgia overcharging state employees, teachers and retirees on their health insurance plans, according to the Atlanta Journal Constitution. Lawyers of the firms Parks, Chesin & Walbert and Hall & Lampros are filing the lawsuit, according to a copy of the complaint obtained by The Signal. Attorney Jeffrey Berhold is also involved with the DCH lawsuit. In January–in an aim to satisfy members of the State Benefit Plan–the DCH changed health insurance premiums, because they were charging higher out-of-pocket costs. On January 27, DCH changed the plans benefit structure, according to the complaints. The formal complaints state Gold, Silver and Bronze health insurance plans established at the beginning of 2014 maintained their respective plans, but the DCH then increased copays and reduced benefits. Since January, the state has overcharged state plan members an excess of $10 million per month in health care premiums, according to The Atlanta Journal Constitution. The Atlanta Journal Constitution also reported A. Lee Parks, a main attorney in the DCH lawsuit, saying there are more than 650,000 members of the State Benefit Plan. The complaint documents state Trecia Neal from Dekalb County School system is the original plaintiff in the lawsuit. Andrew Lampros, one of the lead attorneys who filed the lawsuit, and DCH said they could not comment on pending litigation. Parks could not be reached directly for comment by press time.